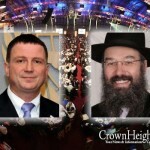 Among the thousands of Chabad emissaries and lay leaders attending this year’s Kinus Hashluchim grand banquet was someone whose presence raised the eyebrows of those who noticed him. Rabbi Rick Jacobs, leader of the Union for Reform Judaism, attended the banquet as a personal guest of Rabbi Yehuda Krinsky. Amid the dim lighting and sartorial conformity of Sunday night’s Chabad kinus, it’s normally pretty hard to find people. 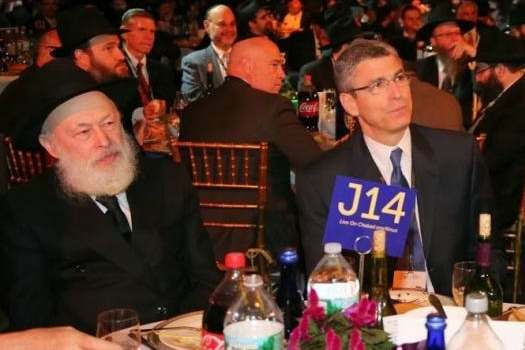 But after my table mate informed me that among the guests that night was the leader of the Union for Reform Judaism, it took only a quick glance across the room to locate the beardless Rabbi Rick Jacobs seated at a table near the stage. When I approached Jacobs, who was standing alone by the stage as a sea of black-hatted men surged around him, he didn’t appear eager to probe the significance of his presence. 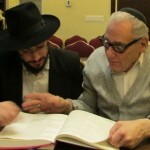 He told me he had been invited by Rabbi Yehuda Krinsky, the head of Chabad’s educational arm, and had happily accepted. When I called the next day to inquire further, I was told Jacobs was in meetings all day. Chabad has been an object of both envy and criticism for Reform leaders. In his installation sermon from 2012, Jacobs said that Reform Jews could “learn important lessons from Chabad about creating non-judgmental opportunities to experience Jewish practice and build sacred relationships.” He also vowed that his movement would no longer permit Chabad to operate on campus without competition. IS HE CHUTCH WEARING A YARMULKA? why do you call him a rabbi? i did not know he was one. is the fact that he is sitting there without a yarmulka, and the fact that being by the dinner probably gave him the opportunity to actually eat a kosher meal , what defines a rabbi by any chance. With a comment like that, I am not so sure you are even a fellow Jew. Why be so insulting? Rabbi Krinsky invited him. Open your heart and mind a bit. What do you think the Rebbe said about A Jew is a Jew? As an individual, if his mother was Jewish (was she?) then he is a Jew, just like the former Catholic archbishop of Paris was a Jew; but he wasn’t there in his capacity as an individual, he was there in his capacity as the head of an organisation whose entire purpose is kefirah and waging war against Hashem and His Torah. Therefore it’s a mitzvah to insult this meisis umediach, and it is forbidden to call him a rabbi without scare quotes. what does A have to do with B? no one is denying he is a jew. but since when does that give him official clerical status? what is worse is, that you legitimatizing the derech of the his denomination. or maybe you want me to open my mind to the extent that it falls out? he is not a rabbi. and he does not deserve the right to be recognized as such. to respect him as a individual yes, but as a clerical leader? but Rick Jacobs is a die hard leftist. He is a board member of both J Street and the New Israel Fund both organizations that want to see the creation of a Palestinian State R”L. He is so leftist that a group of reform jews took out a full page ad criticizing the reform movement for appointing him as leader. This is not something for Lubavitch to be proud of. Do you honestly think he wasn’t wearing a yarmulke? Really? I promise you he was. When I was growing up I questioned the Reform Rabbi at my parents’ synagogue why he attended the local church from time to time, especially when his attendance could be misunderstood. He answered that it was in his eyes merely as a sign of friendship, not as a worshipper, and to him it meant nothing more. Given that background it’s hard to read much into this attendance, as he very well might also attend a church the next night. If i remember correctly the Rebbe did not meet with the reform leader at the time and to give him the same title as krinsky? Probably suits krinsky just fine. To those who were not there and don’t see a yarmulka on his head: In videos of him, only when he looks down or turns around do you see the small grey kipa on his head. The videos were not during “religious” services. When you were not there, It is ludicrous to claim he has no yarmulka in this picture, just because you can’t see it. Judge everyone favorably/ Give the benefit of the doubt. Even were someone to say he actually did not have one on, say it fell off without him noticing it. Just saying. Yes. he was wearing a yarmulke. Of course. If any non-jewish person like a Politician would attend , they would have no problem out of respect to put on a yarmulke . Amazing truly Amazing. I bet when he goes to a Mosque he takes off his shoes and his wife covers her head .Amazing truly Amazing. invite and sit with someone of this ilk in the times of the Rebbe. How can he lend any credibility at all to this man and what he represents which is the only reason he was invited and the #4 Rabbi allows himself to sit with this meshumad?? No wonder shluchim these days don’t act much better. They have a very good role model to learn from. A TRAVESTY TO WHOM? iT TAKES A LONG TIME TO FIGURE THAT ONE OUT. I can’t believe the vitriolic comments here which are devoid of Ahavas Yisroel. 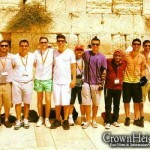 How many people were transformed from hating Torah and Jews, to becoming our greatest friends because of Chabad? How many shluchim today were once, themselves, ignorant or misguided Jews? Yes, his organization opposes Torah-true values and we must condemn and object to it. But it showed tremendous courage and respect for Chabad for him, as an individual, to attend – and we, in turn, should honor and respect that. A forty year old man once said – ‘if I saw a Torah scholar I would bite him like a donkey’ yet that man turned out to become Rabbi Akiva! you already been answered too, in other responses. there is a basic difference between, being represented as an individual, or as a leader of a certain denomination. This is unfortunately a true statement. kissing the tuches of rich and letting them drive to shul on shabbos for years and years without any growth expectation. A Bais Chabad sometimes feels no different than a reform shul. You know who you are, those of you who think you are superior because of the breed of your baloney. With all do respect that is the foundation of a poor life. If you think that your answer is so right that you can disrespect others search for truth then you are a closed minded fool whose sum-total value is to troll the internet. Go home, learn to love, open your minds and in the process, say nothing. Your smug superiority is embarrassing to those of us who care about our fellow men, and Jews. You read that correctly, you can be the most pious, Hallachic Jew in the room and you are still a fundamental embarrassment if you mock the men and women of other denominations because you do not agree with them. So takes this as my request, and as my plea, go home. Stop embarrassing yourselves and me. Learn to have some humility, and to respect those around you, like Rabbi Krinsky. Then maybe you will be able to join the broader debate. Alexander Shindler was brought by Rabbi Hershel Fogelman a’h to a fabrengen and the Rebbe was extremely pleased with his presence even commenting to Rabbi Fogelman by gan eiden hatachton “Naiye Birrurim”. The kinus is not the Rebbe’s fabrengen but it is most certainly an impressive way to show someone the global influence of Chabad. Rick Jacobs is a jew and last i checked we dont discriminate against any jew from any of our programs in Chabad Houses because we were sent by The Rebbe to positively impact every Jew we meet and bring them closer to yiddeshkeit.. so to those attacking Rabbi Krinsky for being mekarev a jew i say shame on you.. Thank you Rabbi Krinsky for leading by example as usual and showing us how no jew is to far from home.. in my humble opinion the Rebbe would have been and is most prob very proud! The link below is a video of the then leader of the reform movement Rabbi Alexander Schindler together with Rabbi Hershel Fogelman a’h at the Rebbe’s Fabrengen. Alex Schindler who was a reform rabbi and leader of the reform movement he a attended as farbrengen as a guest. In classic reform, no kippah was permitted. The concept was to be a Jew in one’s heart, minus any mitzos maasiyos. Today, reform has realized how much people love tradition, so they added it back. Men can choose to wear one, women can choose to wear one… but it’s still all up to the individual. whatever makes ya feel good, basically, is how they roll. #22 I remember that farbrengen I was there. It is questionable if the Rebbe even ever looked at him. He stood there for quite a while and the word was that the Rebbe did NOT look at him. You can see the Rebbe looking at the other direction and quickly scanning his — I remember this like yesterday. The Nayeh Birurim comment was exactly the point made by the Rebbe — like — bug off with the “new type” of problem to my quarters. He asked for a private yechidus and was refused. and most important, what did Rabbi Fogelman accomplish with his friendship with that menuval ?? The Reform then and now is as far from real Judaism as ever. They do everything to undermine orthodoxy and befrat Chabad – so get your head out of the garbage. This kind of gesture can’t be reciprocated, because I doubt Rabbi Krinsky would accept an invitation to attend a Reform gathering. that was just so shallow. if you can’t see beyond that, it makes me wonder if you have a gefil for the Rebbe’s inyonim in a full way, or not. As lubavitchers, of course a Jew is a Jew regardless of their affiliation and level of practice. And ahavas yisroel as defined by chassidus must apply. but inviting a reform leader who is invited and honoured because of his position (see the title of this article) goes beyond the pale of normative orthodox practice and the directives of the Rebbe. This is not just a Shaliach bringing a firend or mekurav. This gives recognition and credence to him not for being a Jew with a neshama, but to the group and their beliefs which he represents. The fact that he is referred to as ‘rabbi’ only further legitimises his standing as a leader of the faith and on equal footing with orthodox rabbonim. Our ahavas yisroel and open approach to all Jews, especially from the shluchim is a living example to all. but there are limits as to how this should be done and in what forum and manner of publicity. These are definitely shaalos one should ask a competent rov with halachic (as opposed to shlichus and people-skills) knowledge. Today’s reform movement is more naive than hateful. We are so close to Moshiach and extreme kiruv is palpable. It is likely that Rabbi Krinsky knows something about the reform Rabbi, a soft spot he might have for us these days, and invited him with simple emunah that the Rabbi would be impressed with Hashem’s world. Let’s give Rabbi Krinsky AND his guest the benefit of the doubt. what does kasha have to do with borscht? who mentioned this guys son or anything else.? Reform rabbis often visit churches and work with galochim. Maybe this one just saw the kinnus shluchim as one more interfaith event.